Mill Creek Blazing Onion is located in the new lifestyle center and outdoor mall, Mill Creek Town Center. It is the original Blazing Onion. It opened in March of 2007 to crowds of Mill Creek residents who craved a good burger. It is smaller than the others with a very small bar and no lounge. A definite part of history in Mill Creek. Our beer garden and outdoor fireplace sit in the Creekside Village’s glass-covered outdoor entertainment forum which features a community stage and four 65″ flat screen televisions. The Creekside Village Forum hosts concerts and other events throughout the year. The mall has a park-like setting and is nestled among nature trails and creeks in the surrounding golf course community. It features over 70 stores, retail boutiques, anchor stores, restaurants and services including the University Book Store, Pier 1 and the Central Market. Come explore this unique and beautiful place and then stop by Blazing Onion for a great gourmet burger, salad or dessert! Our menu features over 25 unique gourmet burgers including a meatloaf burger, a buffalo burger and a wild boar burger. Do you have a favorite burger combination, it’s probably on the menu. We insist on high-quality ingredients such as Tillamook cheese, thick-cut peppered bacon, homemade burger sauces, locally baked buns, fresh produce and ALL Natural ground chuck. For a healthier option substitute our ground chuck for a fresh chicken breast, our house made turkey patty or our house made farmhouse vegetarian patty. We press each burger patty in house from fresh-never frozen, ALL Natural (meaning – no anti-biotics, no hormones, vegetarian fed), 100% ground chuck from Painted Hills. It’s literally a mouth full. We top each of our gourmet burgers with our own top secret signature burger seasoning and serve them on locally baked buns that don’t fall apart when confronted with lots of juicy sauces. Of course we’re not just about great burgers, check out the full menu. There's always something fun happening at Blazing Onion. Like us on Facebook or follow us on Twitter to stay up to date with the latest events and promotions. We have lots of fun at Blazing Onion in Mill Creek! Take a look at our photo gallery for a peek inside. Mill Creek Town Center and the City of Mill Creek host numerous events in the mall. 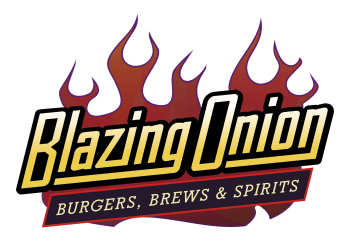 Check out their upcoming events and don’t forget to stop by Blazing Onion for a gourmet burger or local brew.